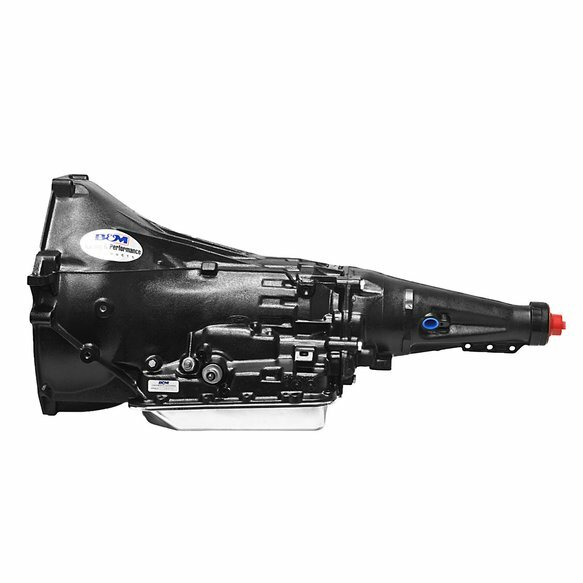 The B&M C6 PreRunner/Trail automatic transmission is for use in RWD Ford applications with a 13.5" tailshaft and 5-1/8 inch separation of top bellhousing bolts. This transmission will work on 289 cid, 302 cid, 351 Cleveland and 351 Windsor engines (does not fit 351M engine). Includes a deep, cast aluminum pan. Internal components include 2.46:1 first gear ratio, 1.46:1 second gear, rebuilt performance pump assembly and governor, all new high performance friction plates, new intermediate flex band, new low roller clutch with lube hole in inner race, new belleville spring, and fully recalibrated valve body. Intended for off road/trail use. This transmission features a manual/forward valve body. Max 600 HP / 550 Ft/Lbs.